What if everything you thought was true turned out to be a lie? You didn’t know who to turn to or who to trust. Some times, life feels like that. But we emerge from the shadows and are warmed by the light and reality. After a power outage in a skyscraper, Stillwell winds his way down 27 flights of stairs. He’s joined by a woman, Shela (Diane Baker). They are unable to see one another, but she says she knows him. Stillwell has no idea who she is. At street level, Shela realizes it is Stillwell. She is angry with him for deceiving her and runs off. He chases after her down four flights of sub-basement stairs. But she’s gone. Back on the street, he learns that a man had jumped or was pushed out the window to his death. That man, Charles Calvin, was the head of Unidyne, a humanitarian organization that works for world peace. His name means nothing to Stillwell, and he moves on. When Stillwell returns to the building he works in, he heads down the stairs in search of the sub-basement levels. Another name that means nothing to Stillwell. He manages to get the upper hand on Weston and gets rid of him. Then, he begins his search to discover why he has no recollection of events over the past two years. At the same time, he has flashbacks to a time, place and people he can’t remember. A visit to a psychiatrist was frustrating. The shrink does not buy that Stillwell is a “cost accountant” as Stillwell says or that he has had amnesia for the past two years. He tells Stillwell that “unconscious amnesia” lasts – at most – two days. 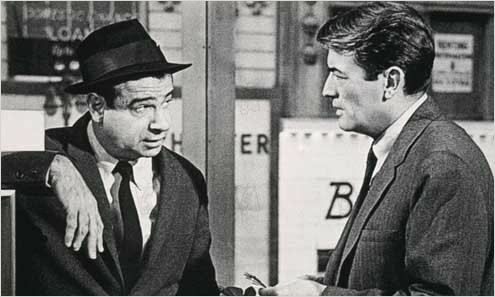 Stillwell hires a detective, Ted Caselle, (Walter Matthau) to find out who “David Stillwell” is and why someone is trying to kill him. Caselle confesses that this is his first case. Nothing adds up. They go to Stillwell’s office – down the hall from where Charles Calvin’s office was – only to find it doesn’t exist. When the detective asks Stillwell what he did as a “cost accountant,” Stillwell doesn’t know. Caselle also can’t see Stillwell in that line of work but he believes Stillwell’s story. The convincer? He spotted a man (George Kennedy) following them. He turns out to be one of the menacing men who is trying to kill Stillwell. Stillwell is puzzled why as he didn’t know Calvin. “Your nightmare began at almost the exact moment his ended,” Caselle says. 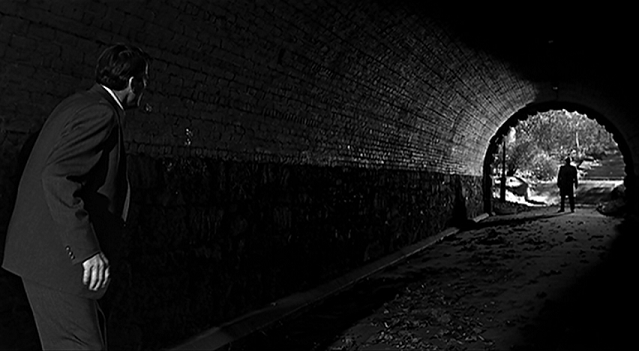 Everything leads to a dead end … as do some of the people closest to Stillwell. Bit by nightmarish bit, Stillwell discovers who Shela is and what role she played in his life. Each flashback fills in more of the memory gaps, Stillwell realizes who he really was and what he is trying to forget. This film noir, psychological drama is one of my favorites. Please share one of yours in the comments below. Sounds too tense for me . . . I did recently watch “The Croods” and really liked it. We both wrote about movies this week. I will have to look for Mirage. I’m pretty sure I’ve seen it, but I don’t remember it. As far as film noir, one of my favorites is “The Third Man.” I also love Hitchcock’s psychological thrillers, and the more recent film, “Memento.” Perhaps that might be neo-noir? I only know of one version of “The Third Man,” with Joseph Cotton and Orson Wells–and that zither music! Sorry. I was thinking of Alfred Hitchcock’s “The Man Who Knew Too MUch.” He made it in 1934 and again in 1956. Oh yes. I like both versions of that one! I don’t watch many old movies, but I might have to make an exception for this one. It sounds really good. It has a Hitchcock vibe to it, and I’ve watched most of the old Alfred Hitchcock films. Those were always my favorites. Hitchcock is one of my favorites as well. Judy it sounds like an intriguing film. I have never heard of it. Which is strange because I like Gregory Peck and watched a lot of old movies in my time. Thanks for the review. The first thing that pops into my head is the sketch on Garrison Keillor’s “Guy Noir.” If you are familiar with the Prairie Home Companion radio show, you know that the announcer introduces the anecdote in a mysterious voice “Guy Noir, Private Eye,” drawing out each syllable. It lasts only about 10 minutes, and it is more worthy of laughs than of shudders. But still . . .
You are quite an eclectic movie-lover, Judy, as am I.
Marian … I love “Guy Noir.” I bought a CD (one or more) of his show. You’re right Garrison Keillor is hysterical and captures that genre perfectly. My aunt didn’t go to a lot of movies, Judy, but MIRAGE was a tie as her favorite (REBECCA was the other.) When you think about it, MIRAGE was way ahead of its time, and the effect was astounding. I’ve never seen this movie, Judy, but your post has intrigued me. I love Alfred Hitchcock, “Psycho” and “Rear Window” have always been two of my favorites. “Silence of the Lambs” is one movie that I’ve never been able to watch alone. After all of these years, it still gives me the chills. I have never seen that film, but will look for it now. 🙂 Thanks for the riveting review. I have never seen that film, Judy, it looks so good . I love Gregory Peck… what ever he is in he is completely believable . There was a dark film I saw once when I was about twelve and I have never seen it since , yet , it has stuck deep down in my memory . I was staying at my Grandmother’s house and together we watched ‘Whatever Happened to Baby Jane ‘ Betty Davis and Joan Crawford ( I believe the two were never the best of friends in real life ) I found it quite scary, but pretended to my Nan, that I was fearless . Have you ever seen it Judy ? I would like to see it again to see if it has the same impact now as it did then . I find that with books don’t you ? when you go back to book you loved a youth you wondered why you liked it in the first place . Cherry … Betty Davis and Joan Crawford were two twisted sisters. I remember it well and it was scary. If you liked that film, you might enjoy Betty Davis in “Hush, Hush Sweet Charlotte.” I haven’t seen either film in years, but they did leave a lasting cinematic impression. Judy, this was a very good summary of the movie, “Mirage.” You helped fill in the gaps of my faded memory of this great film. There was a bit of confusion in identities and some kind of trickery found in HItchcock’s movie, “North by Northwest.” I believe that there is a point where proving what really happened becomes a challenge for the characters to convince the authorities. (Cary Grant, Doris Day and a great cast were in this film, I believe.) I felt your example of feeling a bit insane is a great psychological ploy utilized in several movies. Judy, I have not seen “Mirage,” for quite some time now. You have me wishing I could go get it and watch it today, but will be heading home from the library and probably getting ready for the Academy Awards very soon. I am also glad you mentioned, “Charade,” and now I know it wasn’t a Hitchcock film! Smiles! Oops, Judy! I checked and I gave the wrong blonde actress in my above comment. The leading female character was played by Eva Marie Saint. Thanks for sharing this great film and hope to check it out and see it again. Robin … Both “Mirage” and “North by Northwest” did manage to take you first one way and then in the opposite direction. Great movies. I believe “Mirage” might be available on “Netflix” or even the IMDd database. Be careful though as there is more than one movie by this name. I think the original made in 1965 was remade in 1990. Well, so glad you are able to straighten out my brain waves for me, Judy! At least there was a Doris Day movie and glad you mentioned the nice actor, Jimmy Stewart. I didn’t watch the “Hitchcock” fictionalized bio. A friend and I disagreed about some of the aspects of it. Tippi Hedren was a talented actress and, from what she said, she objected to Hitchcock’s advances, etc. She says she was unable to get other work because he had a contract for her to be in his films. From what I read in Francois Truffaut’s book on Hitchcock, Hitchcock was unable to hire some folks to star in his films because they were under contract elsewhere. That’s how the studio system operated then. I just prefer to focus on his talent as a director and not on his personal life. My favourite film on the illusions and tricks of the mind is The Trueman Show and also The Others with Nichole Kidman which I think I mentioned to you before. The only trouble with films like that is, as brilliant and entertaining as they are, the full illusion only really works once. The ones I watch several times over tend be films like Notting Hill, Ameilie or Sliding Doors. Or Elergy (Ben Kingsley & Penelope Cruz) absolutely beautiful film that one. I’m not quite sure why I prefer watching meaningful moments over and over instead of the suspense – I just do. Suzy … Is the movie, “Gaslight” (1944) with Charles Boyer, Ingrid Bergman and Joseph Cotton? The plot contains some of the elements you mentioned. I’ve see “Mirage” three times now. Even though I know how it ends, I love the plot and the characters. I wouldn’t want to be in that type of psychological turmoil where I didn’t know who to trust or who I was. That is frightening. Any time, Suzy. Maybe I should start a detective agency for hunting down old films. 😉 I’ve never seen the film, but I’ve heard of it and it is a classic. I was a real Gregory Peck fan and of course loved that swashbuckling Errol Flynn. Wallace Beery too esp Treasure Island. According to “Halliwell’s Filmgoer’s & Video Viewer’s Companion,” Diane Baker was in a couple more movies – the last one in 1968. After that, she acted in TV. Did you know she also was in “Marnie” (1964) with Tippi Heddren?